Researchers at OSRAM Opto Semiconductors have succeeded in manufacturing high-performance prototypes of blue and white LEDs, in which the light-emitting gallium-nitride layers are grown on silicon wafers with a diameter of 150 millimeters. 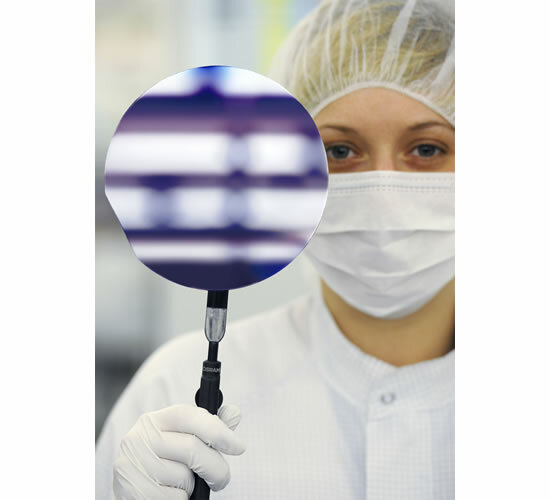 The silicon replaces the sapphire commonly used until now without a loss in quality. Already in the pilot stage, the new LED chips are to be tested under practical conditions, meaning that the first LEDs on silicon from OSRAM Opto Semiconductors could hit the market in just two years. This is a pioneering development for several reasons. On account of its widespread use in the semiconductor industry, the availability of large wafer diameters and its very good thermal properties, silicon is an attractive and low-cost option for the lighting markets of the future. Quality and performance data on the fabricated LED silicon chips match those of sapphire-based chips.